As you play the course, you won't find any tricked-up water hazards or blind shots; what you see is what you get - spacious and inviting fairways with mounding on the peripheries and around the greens. Four holes border a natural preserve and various water hazards such as creeks, lakes and ponds come into play, creating scenic views on 14 different holes. Each tee box at The Legends has five sets of tees numbered 1 - 5. The scorecard lists two more sets of "Combo Tees," giving you 7 yardages to choose from between 6650 yards to 4913 yards. As you make your way around the layout, you'll see many parts of the community and experience a challenging course at the same time. 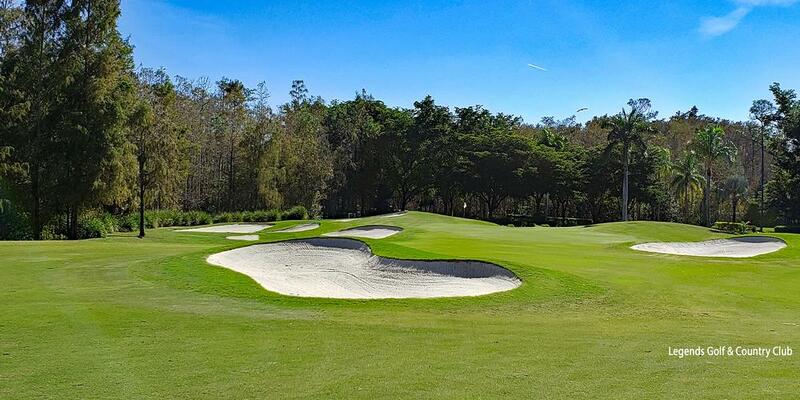 The golf course is set among ancient live oaks, cypress preserves and palm trees, seventy fairway and greenside bunkers keep you honest off the tees and around the greens. There are only 3 forced carries over water with the longest being approximately 40 yards. The maintenance crew is continually making enhancements to an already beautiful facility and the abundance of wildlife, and innovative course design will keep you coming back for more. 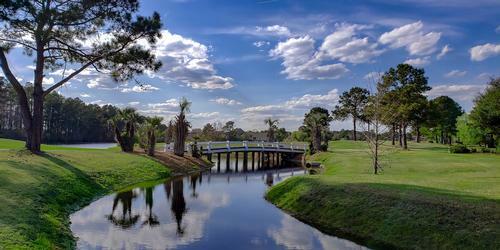 Before your round, be sure to get loose at Legend's Aqua Range Practice Facility. The range is over 300 yards long, letting most players hit every club in their bag There are 4 targeted greens at 100, 130, 170 and 210 yards to help improve accuracy. 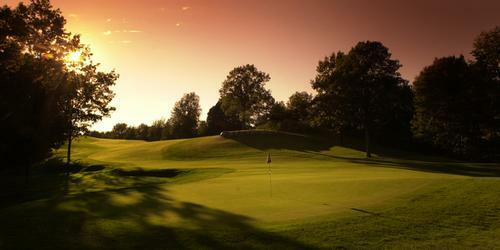 For added practice, Legends also has a chipping green which can accommodate shots up to 25 yards and a practice bunker. The 12,000 square foot putting green will help you get used to the speed and breaks you'll soon be facing. 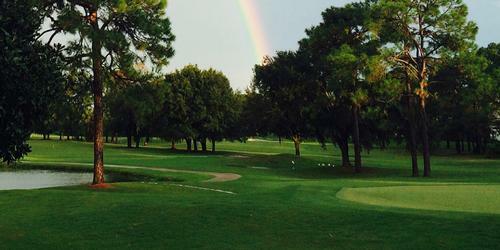 The golf course and all of its amenities are open 7 days a week. 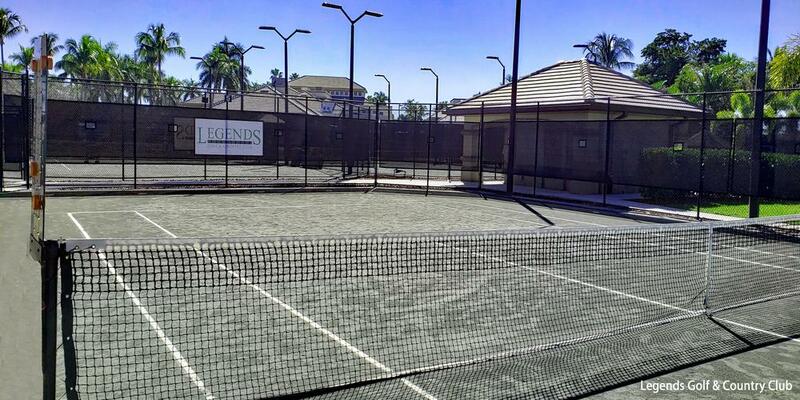 Legends also has some great tennis facilities and their tennis program is well respected within the area. When Legend's Tennis Center opened, there were 6 lighted Har-Tru courts; in September 2013 court #7 was added. New LED tennis court lights were installed as were four new pickleball courts, which officially opened in 2018. In case you need to work on your serve or volley techniques, on-site tennis professionals are available to give you all the resources you'll need to have fun and improve your skills. 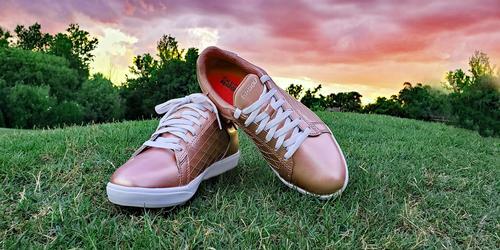 They offer all kinds of tennis services including lessons, clinics and a full-service tennis pro shop. They want to provide you with the best tennis experience in the Fort Myers area. Another popular sport at Legends is bocce ball and their Bocce Courts are a favorite. You'll find four bocce courts available for league and social play with a covered seating area in between. 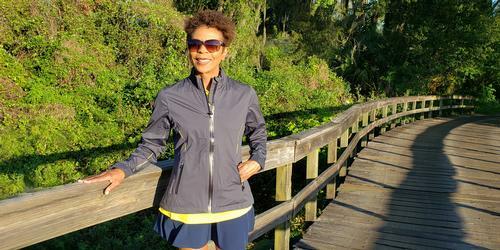 It's never too late to start a healthier lifestyle and making physical fitness a part of it is always a good idea. . Fitness Director Jodi Sodano's staff of trained fitness professionals will get you on the right track, whether you're working out for the first time or are a regular. Legends offers over 45 group fitness classes each week including Zumba, Aqua Kick and Yoga. The Fitness Center is open 7 days a weeks from 5:30 AM to 11:00 PM. Personal Training is also offered through Fit Forever. A very unique feature of Legends Golf & Country Club is Powerhouse, an amateur theater and dance crew. Powerhouse initially started out as a Fitness class and has slowly morphed into a crew of over 45 members; a multi-talented group of performers, behind the scenes artists and helpers. Powerhouse is best known for stunning costumes, imaginative choreography, and features an entire cast over the age of 51. Want a quick workout? Try doing a three-minute performance in full costume and see if you don't get your heart rate up. A full performance lasts about 45 minutes. As country club pools go, Legend's is the perfect mix of invigoration and relaxation and the poolside waterfall only adds to the experience. 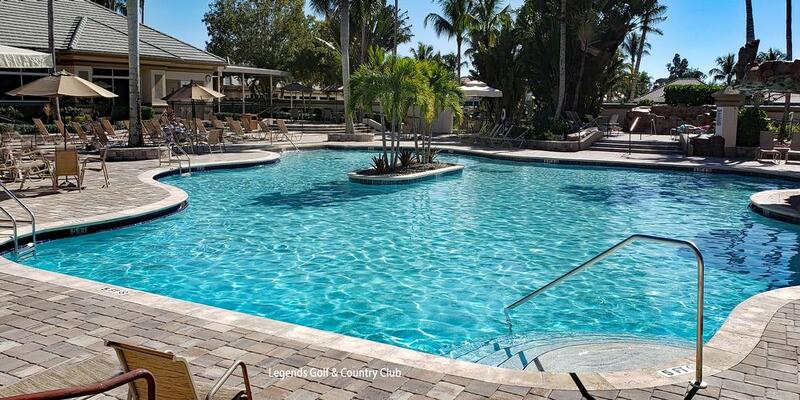 It's the perfect place to cool down after a round of golf, game of tennis or a workout in the Fitness Center. Members can also partake in a number of vigorous water-workout programs including Aqua Zumba, Aqua Cardio or Aqua Kick fitness classes. The pool is open daily from dawn to dusk. Legend's 35,000 square-foot clubhouse is home to two phenomenal dining venues, plus the recently opened Sunset Grill. Dining is a big part of many clubs; some potential new members hold it in high regard when deciding where to join. The options at The Legends won't disappoint. The Main Dining Room offers a blend of casual and fine dining, leaving both Members and guests with fond memories of an enjoyable dining experience. The Main Dining Room hosts several Member Events including Italian Night, Twisted Tuesday, Friday Night Lite Fare Buffet and a Sunday Breakfast Brunch. If you're looking for something more casual, perhaps after your round or last tennis set, The Pub is the place to be. It's located in the clubhouse and features a popular Pub Fare Menu. The Pub also serves up a Plated Breakfast on Saturday mornings and you can also enjoy a refreshing beverage on the newly expanded patio overlooking the golf course. For al fresco dining, the newly opened Sunset Grill is the place to be. Sunset Grill opened last month, has seating for 174 patrons and features tables either on an outdoor terrace or undercover. Sunset Grill overlooks the pool, driving range and putting green and offers stunning vistas of the magnificently landscaped grounds. 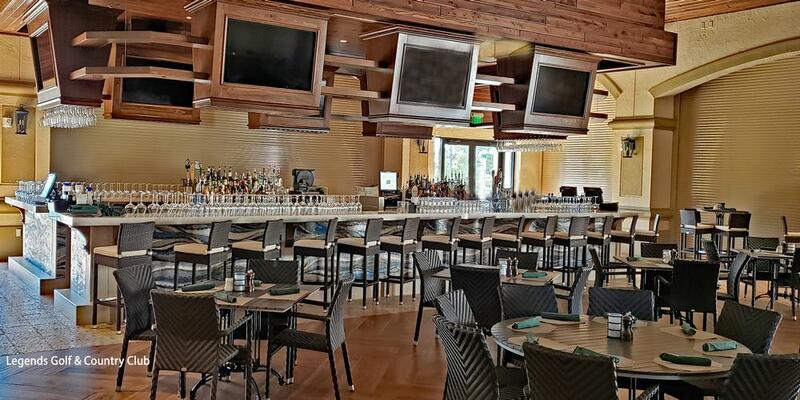 Sixteen televisions strategically positioned around the Sunset Grill will let you catch your favorite team in action. Sunset Grill also has its own kitchen, so each dish you order arrives fresh...and hot! Stop by and check out their new menu. Being such a desirable community does have its perks and Legends is the perfect location to host a wedding or special event. They provide professional in-house catering and their energetic team of banquet professionals will help you organize your next function right down to the very last detail. The culinary team will create the perfect "fine" dining experience with customized menus for your event. Whether it's a plated entree or buffet style meal you won't be disappointed! Their goal is to live up to their reputation for dependability and not only meet your expectations but exceed them. They are experts at hosting weddings, rehearsal dinners, corporate gatherings, bar mitzvahs, birthday celebrations, memorial receptions, and golf events. Whatever the event, Legends promises to make your special day one that you and your guests won't forget! There are a total of 1291 residences set in 21 neighborhood communities, 461 have social memberships, the rest are golf and social memberships. It's important to note that all homes within the community come with either a social or sports membership. Memberships are not transferable, so when you buy a property, you inherit either a social or sports type of membership. 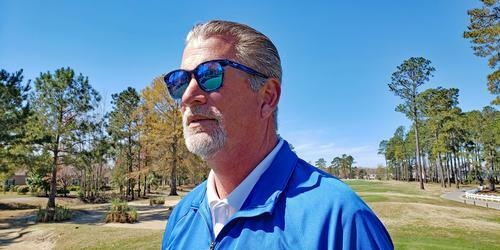 If you're looking to rent - and many newcomers to the area want to rent before they buy - check out the website (www.legendscc.com) for a list of properties available within the gates of Legends Golf & Country. 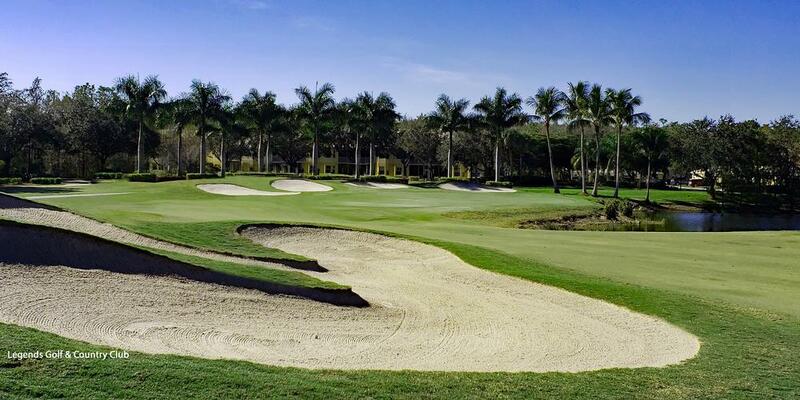 If you're looking for a Southwest Florida home in a highly valued, bundled private golf and country club community then The Legends Golf & Country Club is a place you want to consider. They have everything an active adult could ever want, tremendous dining facilities, an active social calendar and members within the gates that are destined to become good friends.